Uplay games are now redeemed directly on your Uplay account via Ubisoft Connect. To find out more, please click here. HMS Duke of York (King George V battleship class) – the ship responsible for sinking the German battlecruiser Scharnhorst and carrying Churchill to America in one occasion. 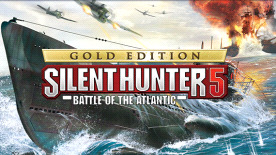 110-page PDF guide detailing the crew, submarines, ships, and weapons of Silent Hunter 5: Battle of the Atlantic. Step behind the periscope of a German U-boat and take on the Allied Forces in famous battles across the vast Atlantic Ocean and Mediterranean Sea. Put on the captain’s uniform For the first time, walk through highly detailed submarines, access every part of your U-boat, and manage your crew in the new first-person view. Become a real leader Directly command your crew and experience the tension and fear inside the U-boat through the new advanced order system. Test your war strategies Choose your own strategy and select your targets with a new objective-driven, dynamic campaign. Make the enemy react to you Open new locations, upgrades and resupply possibilities, while the Allied ships adjust dynamically to your approach. Your actions will directly impact the evolution of the campaign. Accessibility Enhanced: Prowl the waters with a brand-new user interface. Now, every beginner can successfully command a sub free of confusion. In expert mode, experienced players will be provided with all the necessary information and controls to command the sub completely on their own. Cinematic Experience: Experience the most realistic and immersive Silent Hunter ever created. Improved environment graphics create a powerful level of immersion as you operate authentic, highly detailed U-boats and surface ships. Multiplayer Mode Play in cooperative or adversarial modes in scripted and generated missions.